Brilliant display of stop-motion animation. Tim Burton and Mr. Gerry Ferrell would be impressed (that’s a compliment to all). The third TV commercial for BRAVIA is the most ambitious piece of stop-motion animation ever undertaken. 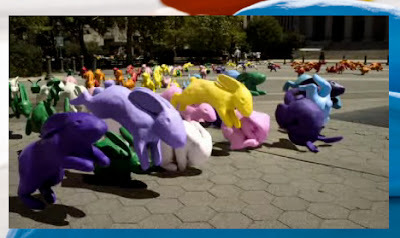 Devised by Fallon and shot over three weeks in New York, the commercial employed 40 animators from Passion and used 2.5 tonnes of plasticine. 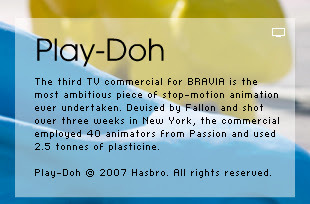 Play-Doh c. Hasbro. All rights reserved. Not up on YouTube yet, but give it time. You can go to Bravia’s YouTube page and see the teaser. I wanted to hate it. I tried so hard to resist its charms. I couldn’t. Love it! I know what you mean. The cherry on top for me was the Rolling Stones. I’m a sucker.